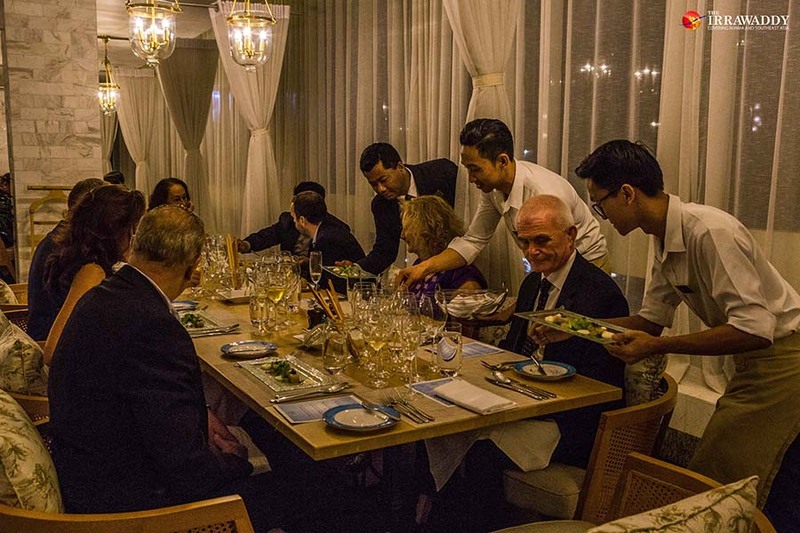 YANGON—If you’re craving some flavorful Italian food, in an exciting collaboration between Melia Yangon and the Embassy of Italy in Myanmar, an Italian Food Week is running from Nov. 10 to 18 at Olea in Melia Hotel. As well as Olea’s regular Mediterranean menu, Italian Food Week features a rare chance to experience guest chef Stefano Santo’s select authentic Italian dishes—much more exciting than the usual pasta and pizza. Chef Santo qualified at ALMA, the International School of Italian Cuisine of Parma in Italy. On Nov. 9, along with representatives from the Italian embassy, members of the media were invited to attend a gala dinner to introduce the Italian Food Week. Italian food is known to be one of the few truly global cuisines and it generally sticks to a concept of simplicity. Many dishes have only two to four main ingredients. Chef Santo’s scrumptious Italian food journey started with grouper fish served with burrata cheese sauce, ginger mayo and parsley. 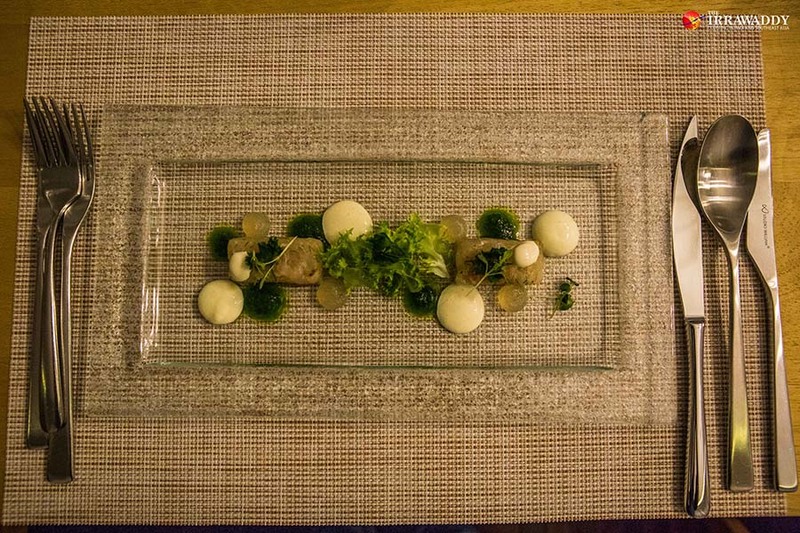 The presentation of this dish was artistic with a greenish color due to the parsley, combined with creamy burrata cheese sauce on small pieces of the marinated grouper fish. The cheese sauce didn’t overpower the subtle fishy flavor and the smell of fresh parsley was a wonderful addition to the tasty dish. It was well-matched with a white Italian wine Gewurztraminer. Next, another Italian favorite arrived: risotto. The creamy rice dish was served with beetroot, black mussels and green curry for an eastern flavor kick. 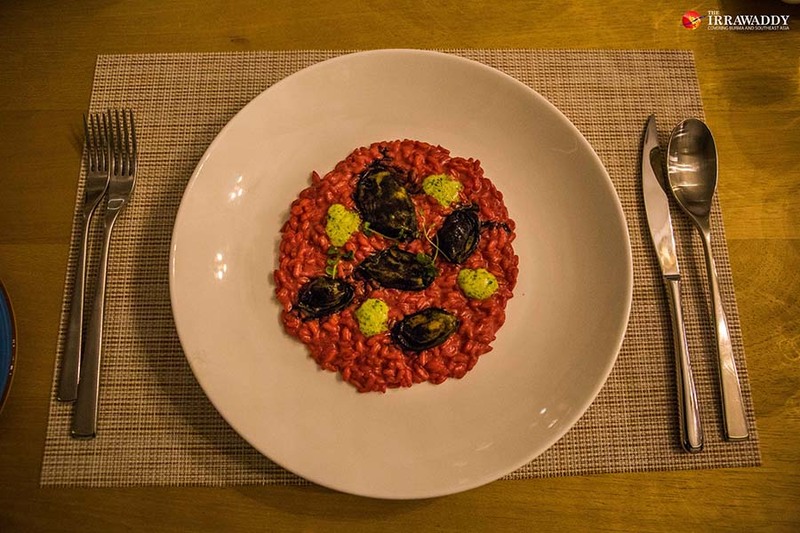 With a fun pink color owing to the beetroot the risotto was topped with fresh black mussels with shells already removed and dollops of green curry. The dish was really delicious and the whole combination was flavorful but by nature, risotto rice is a little hard so it could cause digestion problems and therefore I want to suggest readers eat just a little of it. Then the main dish, beef sirloin served with Granny Smith apple, rocket dust and beluga lentils was in front of me. The steak was medium grilled with wine sauce poured over it and topped with beluga lentils. The dish also included mashed apple. The portion was not very big and the whole dish was a good balance of flavors. The flavorful sauce was perfect with the tender meat and the beluga lentils were a delightful addition. Perhaps surprisingly, the mashed Granny Smith apple was delicious too. As a person who likes sweet things, dessert time is full of excitement for me. 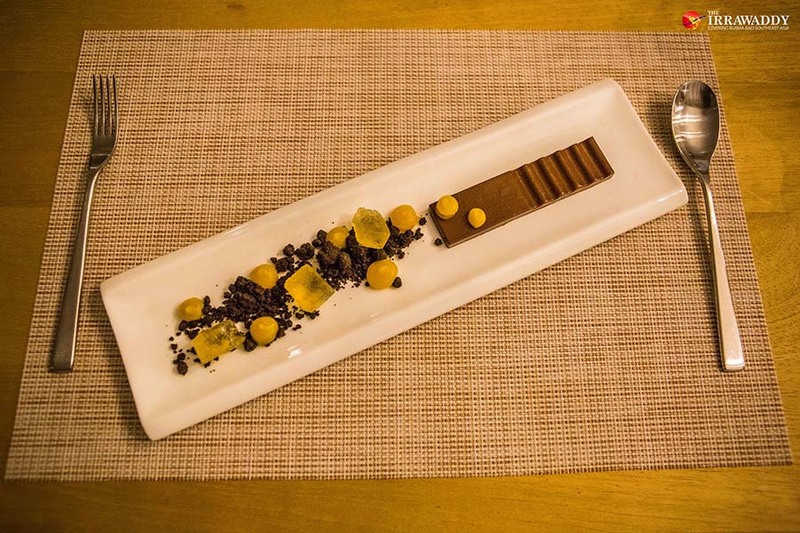 For this meal, dessert was dark chocolate ganache with artemide rice, pumpkin and beer. Dark chocolate is my favorite kind of chocolate and the small dust sprinklings of artemide rice were perfect with the creamy pumpkin. The chef makes the beer into a jelly and it was a very different experience for me to taste it as jelly, but it worked. The whole dessert combination was a mixed flavor of sweet, creamy and bitter tastes. Before this opportunity, I was only familiar with Italian foods like pasta, pizza and spaghetti so it is hard to say which was the best part of the night for me because all the dishes tasted truly amazing. The Italian Food Week menu is only available for one week at Olea and the dish prices range from $7 to $21. 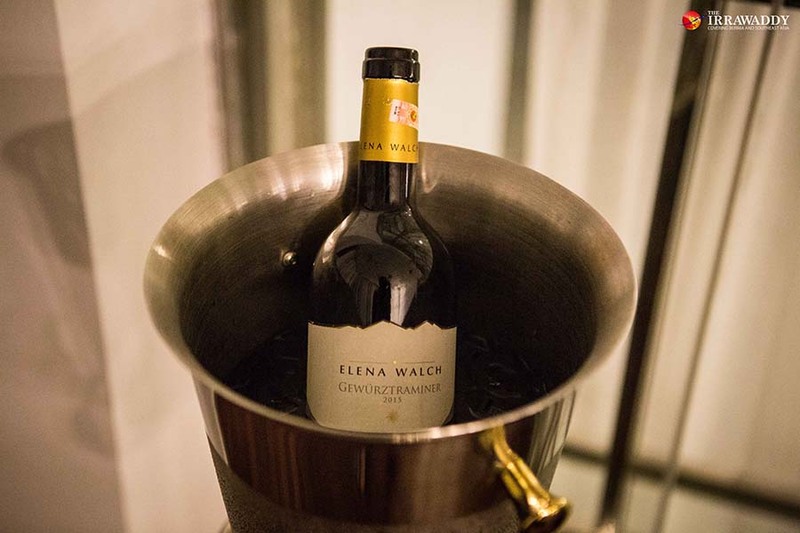 Special wines are also on offer including Gewurztraminer, Masselina 147 Chardonnay, Fiulot Barbera D’asti and Tosti Pink Moscato Dolce. Olea’s staff members serving diners at the Italian Food Week gala dinner. A multitude of popular and authentic Italian delicacies and dishes of sweet and savory flavors are awaiting your discovery at just a booking away at Melia Hotel.